He has a green ID tag on his leg. 4 years old green conure with a red tail. He will be scared to fly. So if you spot him, just call or text me. 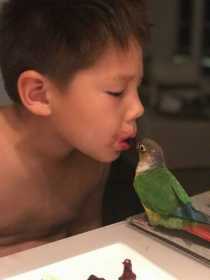 Our kids will love to be reunited with their baby bird whom they grow up together.